"Are health coaches a real thing? What do they actually do? Something like that sounds really expensive.” In our survey two weeks ago you said the most helpful thing for your health improvement would be a health coach. Here is the lowdown on this very real and up-and-coming service. There are a lot of coaches out there. There are a lot of health and wellness coaches out there too. As you know, I have hung out my shingle as an "evidence based" practitioner. Accordingly, if I were to get a wellness coach, I would want one that practiced evidence based coaching. I have done a little homework on our behalf, and found that the American College of Sports Medicine certifies only one coaching program in the country at this time, wellcoachesschool.com. Lucky for me, the medical fitness center (health club) associated with my hospital utilizes wellness coaches certified by this school. However, I too assumed this would be on the expensive side. Here's what I found out. First of all all, prices are cheaper if you are a member of the health club, which stands to reason. Secondly, they offered different packages. The cheapest package without membership was $200 and consisted of eight sessions over eight weeks. This would provide personal training in a small group. This sort of thing would be an out of pocket expense. On the other hand, I was pleasantly surprised to find out that the more extensive packages involving weight management and wellness coaching for those with serious or chronic medical conditions might be covered by insurance. These programs range from $250-$750 and take place over several months time. Of course any coverage by insurance would have to be determined beforehand and would have to be based on documentation in the patient's medical record by a patient’s physician, someone like me. Although I was encouraged by all of this, I did come away from my fact-finding with the impression that my patients who need this most are simply not going to be able to have access to this, afford it or obtain coverage for it. This led me to the idea of being your own coach. This is not my idea or a new idea. A simple Google search revealed several reputable sites which deal with this topic. I will share them with you now. I am thinking about getting wellness coach certification from wellcoachesschool.com. So much of what I do in the course of the day with my patients is wellness coaching. While it is true that I deliver babies and perform female pelvic surgery, I spend a lot of time and energy trying to get my patients to be well. I would like to be as good as this as possible. I looked into the course curriculum, and I noticed they had two key textbooks, one you get when you register for the classes, and is rather costly. The other is available on Amazon.com for a modest amount of money ( At this time a used one is $0.43 plus $3.99 for shipping. ) 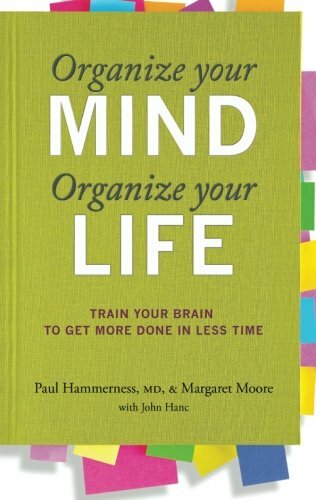 It is called "Organize your Mind, Organize your Life” with the subtitle,”Train your brain to get more done in less time”, by Margaret Moore and Paul Hammerness. I think this is a great place to start for people who want to be their own life coach. I know I am going to crack open this book as soon as possible. Beyond that I am still going to be giving continued thought to what, in practical every day terms, could help people meet their basic health goals in nutrition, fitness, and stress management. Stay tuned for more tips on achieving wellness on next weeks Wellness Wednesday.